Leyla Güven Hakkari MP of pro-Kurdish Peoples’ Democratic Party (HDP) and co-president of the Democratic Society Congress (DTK), who was on an uninterrupted hunger strike for 80 days, was released by the court on Friday. The court releases her with a ban that prevents her from leaving the country. Guven was taken to her house by ambulance. She will continue her hunger strike at home. The trial of Leyla Güven was conducted by the 9th High Criminal Court in Diyarbakır, a southeastern Kurdish dominance city of Turkey. Güven did not attend the hearing. To show their support, many local and international politicians, particularly from European leftist parties came to the court for the trial but did not enter the courtroom. During the hearing, which was not attended by lawyers, the prosecutor asked for the continuation of Güven’s detention. After a short break, the court announced the decision, putting a travelling abroad ban for Güven and announced the court’s decision to release her from prison. Güven was elected as an MP representing the HDP on 24 June elections last year after she was arrested. Her lawyers stated that Güven was a member of parliament and filed an application last year to the court. On 29 June 2018, the court decided to release her. However, the prosecutor’s office objected to the decision. Diyarbakir 10th High Criminal Court examined the case, and on the same day, on the grounds of suspicion of gross misconduct, revoked the decision. In the last hearing which was held on 7 November 2018, Güven started an uninterrupted hunger strike indefinitely, arguing that the principle of a fair trial was ignored. Following the court decision, Güven’s lawyers went to Diyarbakır E-type Prison to meet with the prison administration. 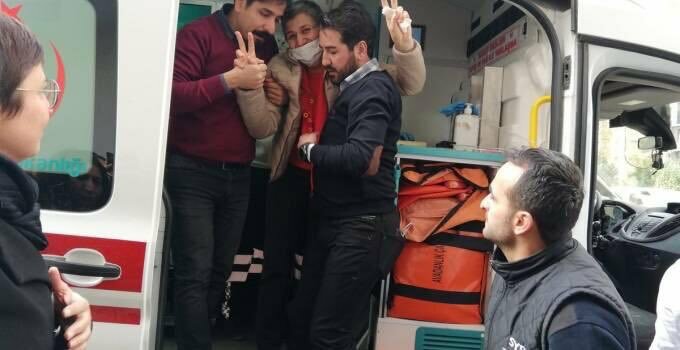 The lawyers requested from the administration to release Güven from prison with an ambulance accompanied by medics, given her poor health. An ambulance belonging to the Ministry of Health arrived at the prison. The prison administration also provided a wheelchair for Güven who could not walk due to the effects of the hunger strike. Prison gates was closed off with police buses to prevent journalists from recording Güven’s departure. A large group including Buldan and Öztürk and other HDP deputies, gathered in front of the prison building. Güven was released at about 1:15 pm (local time). She was then taken to her house at the Bagcilar district of Diyarbakir. HDP Co-Chairperson, Pervin Buldan, said that the court’s decision to release Güven was positive, and added that Güven would continue her hunger strike.